I have always found maps of the motions of Earth's continents fascinating, so it is really cool to see some gorgeous new reconstructions of what Earth would have looked like to spaceborne observers over the last 750 million years. They've been published as part of the Visible Paleo-Earth project, which is combining current imagery of Earth's land and cloud cover with geologists' reconstructions of both the extent and the climate of past continental landmasses. They look a lot like the "Blue Marble" simulated images of Earth that are so popular on the Web, but the configurations of the continents are decidedly different, making the globes look both familiar and alien. 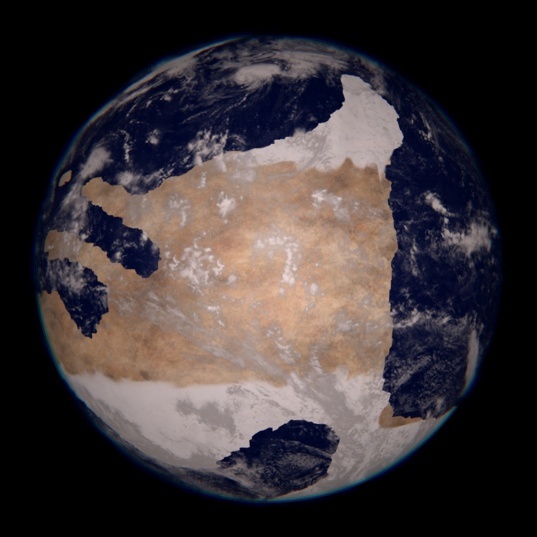 Here, for instance, is their simulation of what Earth would have looked like from space 220 million years ago, at the beginning of the Triassic period, the dawn of the age of the dinosaurs, when all the continents were assembled into the Pangaea supercontinent, and the climate was warmer than it is now. This period of Earth's history is well documented in the geologic record, so the outlines and colors of the continents are mapped in great detail. 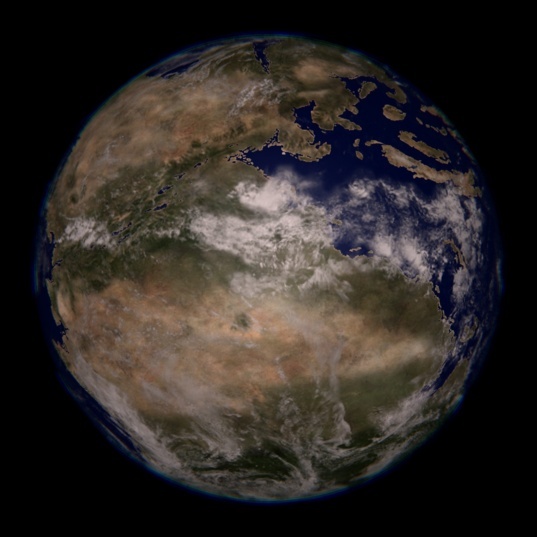 The verisimilitude of the image arises from its basis on spacecraft observations of present-day Earth, combined with paleogeographical information about the climate and land cover of Earth's landmasses in the past, combined with optical physics to simulate the atmospheric effects on the appearance of the globe. Back before Pangaea, though, the paleogeography gets significantly less detailed. We have a pretty good understanding of what Pangaea looked like because we can track the motions of the continents backward across the ocean basins that formed when Pangaea split apart. But that easy-to-read record of the continents' motion really only goes as far back as Pangaea; almost none of the ocean floor is older than 150 million years old. We have other clues to the previous motions of the continents, in the form of matching mountain ranges and distributions of ancient life forms and paleomagnetic data, but they lack the resolution of the ocean floor record. So earlier globes in the Visible Paleo-Earth project aren't as detailed. Take, for instance, this one, showing the supercontinent that existed even before Pangaea, which geologists have named Rodinia. Rodinia was assembled during the late Precambrian, and geologic evidence suggests that its surface was often covered almost to the tropics with glaciers. (Some geologists even argue that all of Earth was ice-covered at some times, though that's disputed.) I do wonder if this simulation ought to also include some sea ice, especially near the poles. The breakup of Rodinia happened at roughly the same time as multicellular life first appears in the geologic record. With no multicellular life, there would have been no green plants, of course, so the land surface is basically rocky. The first greening of the land surface probably didn't happen until a bit later (though this, like everything else, is disputed); it would have started with algae and lichens. The goal of the project isn't just to produce pretty pictures; the locations and colors of continents are extremely important inputs into climate models. For example, just imagine how different ocean circulation would have been in a world with only one continent. That strongly affects weather. So these visualizations should help climatologists understand past climate and, perhaps, future climate, too. And by asking how these different views of Earth would appear as point sources of light, we can understand the range of possible appearances that very Earth-like exoplanets might have. There are tons of other resources at the Visible Paleo-Earth website, including nifty posters showing the motions of the continents through time, so go check it out! These videos are cool, though the cloud patterns are clearly based on modern-day Earth's continent distribution -- I keep seeing shadows of Australia and South America's coasts popping up as cloud banks.